The Ariana Institute for Wellness Education offers an outstanding resource for those interested in self-care for massage therapists, featuring topics that include Body Mechanics, Stretching and Breathing, Meditation as a Therapeutic Tool, and Mindfulness in a Therapeutic Setting. The Ariana Institute’s Self Care for Massage Therapists Manual is part of a series of massage manuals that are designed to help deepen the knowledge and understanding of current massage therapists and introduce new, upcoming massage therapists to the world of massage and bodywork. To order your copies of the Ariana Institute’s Self Care for Massage Therapists Manual visit www.amazon.com/author/arianavincent. 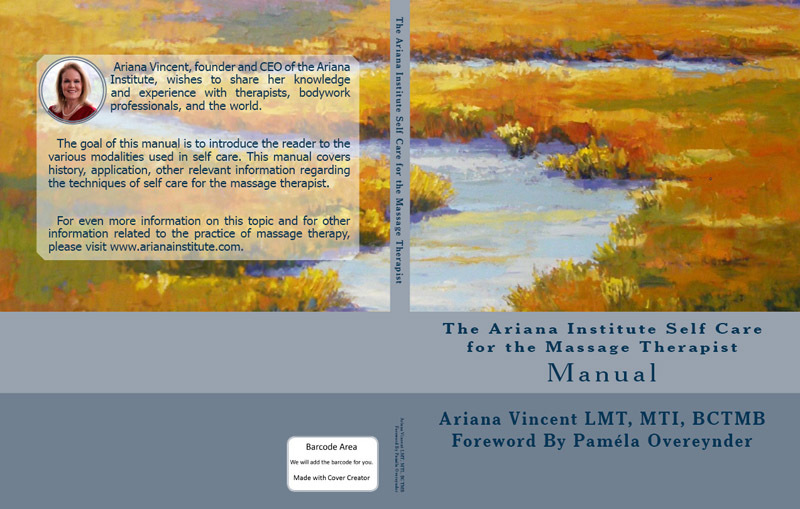 This manual incorporates detailed protocol descriptions, high definition instructional photos, links to the Ariana Institute’s online instructional videos demonstrating a wide variety of techniques, marketing and practice building strategies, and resources for advanced learning to encourage a comprehensive understanding of self care modalities that are beneficial in a massage practice. The Ariana Institute’s therapy manual series has been over 16 years in the making and is a monumental achievement for the Ariana Institute. The Self Care for Massage Therapists Manual is a perfect source of deep study for massage therapists and those seeking to expand their understanding and further cultivate their practices! Here is the foreword to the Ariana Institute’s Self Care for Massage Therapists Manual by Paméla Overeynder, Biodynamic CranioSacral Therapist. Self care is as elusive as the white unicorn in today’s super-connected, super-busy world. Even those of us who know better, don’t always practice because it simply isn’t valued in our culture – lip service maybe, but no real commitment. That’s what makes the massage and bodywork community unique and attractive to the super-stressed, busy bees of the world. They somehow are drawn to massage without quite knowing the secret ingredient – love! And what could be important than for the massage therapist to love herself or himself and pass loving touch on to others. The Ariana Institute’s Self Care for Massage Therapists Manual is a generous and comprehensive guidebook to the many ways loving self care can be practiced. Like so many people, my first massage was a spiritual experience of falling deeply into myself. For the first time in my life I experienced an awakened body and a sense of wholeness. I felt like I had been in a deep meditative state that, no doubt, the very gifted therapist had produced with her presence. I knew immediately that I wanted to help others come home to their bodies. I was in my early thirties and ready for a career change. I completed massage school in 1989 and gradually started to practice. It never occurred to me in the early days that my body would some day “refuse” to do this work that I loved so much. But that’s exactly what happened. 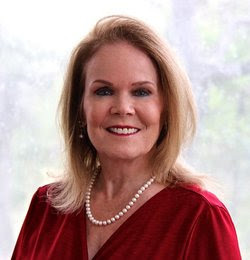 As I got busier and placed more demands on my body, I had various issues, including a frozen shoulder, that I was able to work through with a lot of massage and physical therapy. When I started getting tendonitis in my right elbow, I kept working, resulting in repetitive use injury. Receiving massage didn’t help anymore. I kept telling myself I would work through it like I did with the shoulder issue. Fear for my livelihood kept me working long after it was clear that I was harming my body. Amazing what fear can do. Finally, one night my body simply said NO! And I knew my massage career was over, done, finished. Not a good scenario for the bank account. Fortunately for me, I found Biodynamic Craniosacral Therapy and enrolled in the two-year foundation training and made a very happy transition to work I love even more. Life unfolds in mysterious ways. I have no regrets about doing massage as long as I did or retraining in CranioSacral therapy, but what if? What if I had a copy of Ariana’s Self Care for Massage Therapists Manual as a resource throughout my career? I probably would have extended my massage career by faithfully following the self care credo Ariana so beautifully articulates. Understanding how the body works is essential to prevent injuries. The exercises gathered together in the section on stretching would have served me very well. Fundamentally self care is about honoring and respecting the body/mind that is the vehicle for realizing our life’s purpose. A big part of the life journey is realizing our wholeness and ultimately our oneness with all of creation. A weak and unhealthy body makes this realization much more difficult. As professionals in the field of health care and bodywork, therapist self care is essential, not only for the therapist, but also for the client because the therapist is modeling health for the client. All the work we do to take good care of ourselves benefits our clients and indeed everyone in our sphere of influence. As we uncover our unique, brilliant selves that are whole and complete, we can become a support and encouragement for others to do the same. What I love and appreciate about Ariana’s manual is the way her spiritual intentions shine through. This is true of everything she does personally and professionally. The usual self care books for massage therapists focus more on body mechanics, stretching and maybe breathing exercises. Self Care for Massage Therapists is a comprehensive resource guide covering the basics of body mechanics, stretching and breath work in great detail. The sections on stretching, meditation, and mindfulness practice bring together some of the best writing available today by experts in their field on these topics. And wonderfully, the manual is filled with exercises to expand awareness and consciousness. In fact, what makes this manual unique and so very valuable is its inclusiveness and support of the whole being – body, mind and spirit. A therapist who takes care of his or her body/mind, who meditates and practices mindfulness in life and in work has so much more to offer clients. As practitioners, we don’t just bring our technical skills to work. We bring our whole beings, always a work in progress. Though subtle, our atmosphere or the attunement we radiate has a profound effect on the work we do. If we are calm, centered, relaxed, the client’s body knows and responds. If we are present, focused and mindful of our own bodies as we work, the client’s body knows. If we are breathing well as we work we can help the client bring awareness to the breath. If we are eating well, sleeping well, stretching well, exercising well, getting bodywork, taking time for ourselves, we bring a healthy, happy body to work and the client’s body knows. If we can learn to say no when the body needs down time, and set appropriate boundaries with clients, and communicate clearly, this is self care and the client’s body knows. What we are describing is an expanded vision of what it means to have a healthy lifestyle, to take care of self. Everything we do to enhance our skills and our Being supports and enhances the experience our clients will have during a session. Self care is a continuous process because self-realization is never finished. Along the way we may discover that all this self care work isn’t about self-improvement. It’s about love and respect and a willingness to keep growing, to expand into the fullness of who we always were and are. And this doesn’t happen without the full range of self care practices so carefully and lovingly gathered together in this one place, this one manual. Self care is exactly what it says, care for the self – body, mind and soul. It turns out what’s good for me also benefits my clients. We are all so connected. This manual is not only beneficial for massage therapists but for anyone and everyone. It is a spiritual guidebook chock full of resources and practices. Even advanced practitioners will find much here to enhance and support themselves personally and professionally. What a joy to review the Ariana Institute’s Self Care for Massage Therapists Manual. Its comprehensive approach to self care is a most valuable contribution to the massage therapy literature, an encouragement for the professional practitioner to be a whole and healthy human being. The Ariana Institute’s video introduction to the Body Mechanics, Stretching and Breathing, Meditation as a Therapeutic Tool, and Mindfulness in a Therapeutic Setting CE courses can be accessed below or on the Ariana Institute’s YouTube Channel at www.youtube.com/user/ArianaInstitute. To order your copies of the Ariana Institute’s Self Care for Massage Therapists Manual visit www.amazon.com/author/arianavincent.